Recreate the candour and excitement of a live Bingo Hall with this contemporary mix of Bingo and Slots. Presented by a charismatic and affable virtual cartoon host you will surely enjoy this light-hearted classic. With 25 reels of captivating bingo, this slot is a difficult one to ignore. Read on to join the Wizard. The team at NextGen gaming are filled with passion and creativity, always striving towards innovation and inspiration with regard to their newest games. With their knowledge and expertise, owing to almost two decades of developing games, they don´t fail to meet their promise “to always deliver extraordinary entertainment and quality”. Bingo Billions proves that they’ve stuck to their word. Feel free to view slots games here now! 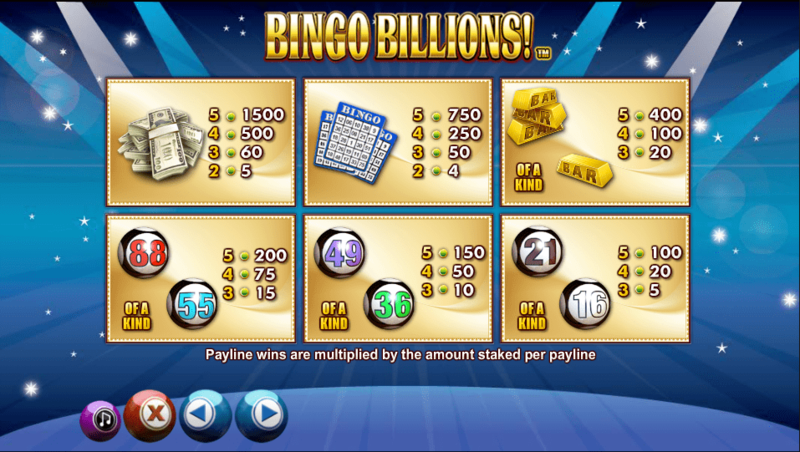 As the name Bingo Billions may have already revealed this modern slot game is all about the classic game of Bingo and all its traditional symbols: numbered bingo balls, piles of cash, bingo cards and gold bars. It is nicely illustrated, inviting you into an immersive bingo world. Although interest in the game solely depends on every player's preference, we managed to compile a list of top 10 online slot games, based on different categories. Check if this game is included. This 5 reel, 3-row online slot game floats in a glamorous background of flashlights and sparkling stars that will change colour in celebration of any free spins you get. 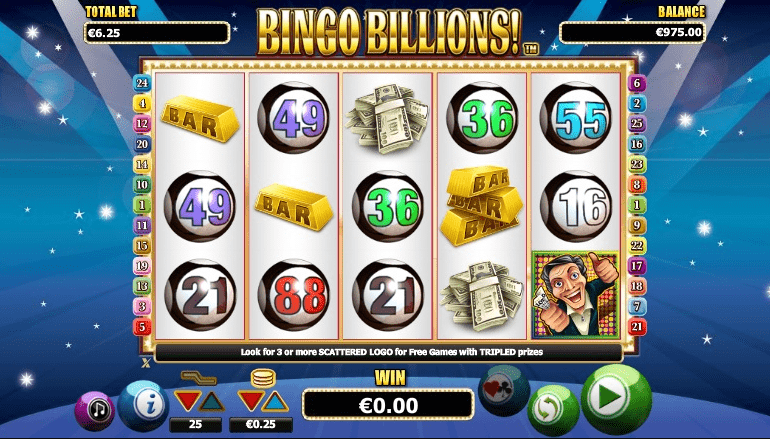 Look out for the Scatter symbol with the Bingo Billions logo, this is where you’ll get your free spins. Combine three scatters anywhere on the reel and win 10 free spins, four scatters gives you 15 free spins and five scatters will lead to an incredible win of 20 free spins. During each of your free spins, all of your wins are tripled. It is a way of making your spins very lucrative and the best part is that the scatters can also be re-triggered. The wild symbol in this engaging game is the bingo caller. He will substitute everything excluding the scatter, increasing your chances of landing on one of the 25 pay-lines and making each spin that tiny bit more profitable. There’s no better pleasure for the bingo caller than helping you complete the paylines, and this is visible by the little jig he does following your wins. 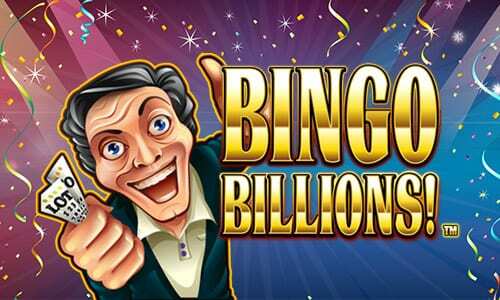 Bingo Billions is very inclusive in its luxurious world and you can bet as little as one penny when you play this thrilling game. However, if you consider yourself something of a high-roller you can also bet up to 50 pounds and watch your balance rise rapidly. To make things even easier for you, the game also includes an autoplay feature, which automatically spins the reels for you, while you sit back and enjoy all the excitement happening in front of you. If you weren’t already convinced by this flashing game and you’re interested in a little risk-taking then wait just a little bit longer as we explain the last feature that Bingo Billions has to offer. The gamble feature can be played after every win. Just click on the “hearts/clubs” button you can find the reels, and guess correctly the colour or suit of the next card drawn and your winnings will be doubled or quadrupled. But what would be a good gamble without any risk? Fail to guess correctly and your winnings will vanish into the distance. 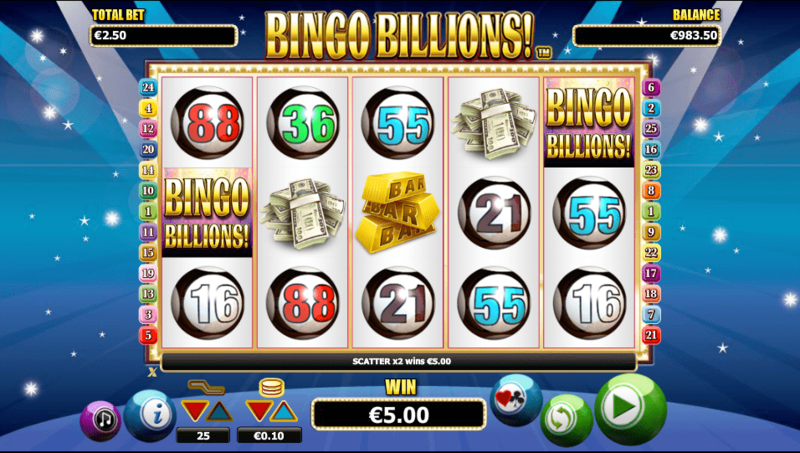 Bingo Billions offers a thrilling and glamorous gameplay experience bringing the bingo theme to another level. The aesthetics are elegant and neat making it very easy for you to keep everything under control. And don't you just love the helpful bingo, caller? It offers very lucrative bonus features and free spins that will fill you with excitement and make you come back for more. The perfect way to give an exhilarating end to a monotonous day at work. Wizard Slots rates this online slot game 9/10. Another top quality slot is Irish Eyes 2.